Avocado is a complete food with loaded nutrients for babies, toddlers, kids and even adults. So I was looking for more ways to include avocado in our weekly diet rather than a simple avocado milkshake, this avocado sandwich caught my attention. So immediately tried it, its not only easy to make but also tastes yummy. Even avocado haters would love this creamy avocado sandwich. It can be given for toddlers above 1 year and kids. For more healthy benefits of avocados and on how to select avocado, check here. 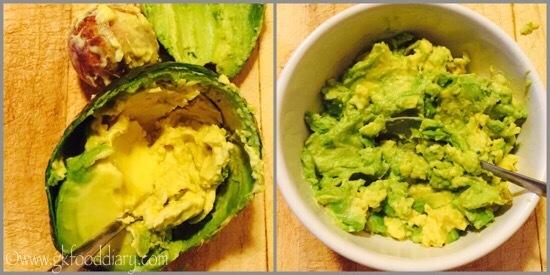 Now Let’s get on to check how to make this easy avocado sandwich recipe for toddlers & kids. 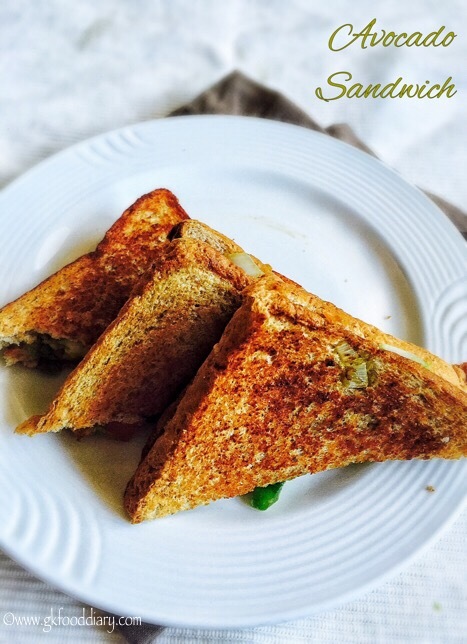 Avocado Bread Sandwich - Easy and healthy sandwich with wholewheat bread and avocado for toddlers/kids. Remove the big seed in the centre part and just sccop out the inner part using a spoon. Collect them in a bowl. Discard the outer layers and seed. Mash the avocados well. Mix all the ingredients in a vessel except bread slices and ghee/butter. Mix well without any lumps. 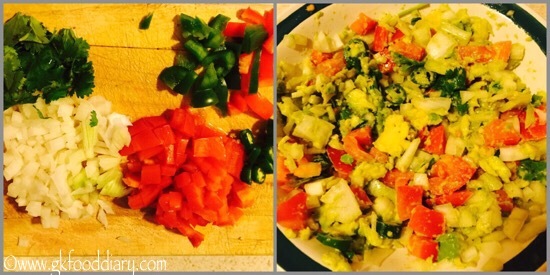 Take a bread slice and spread avocado mix on one side. Close seal it with another side. Apply butter or ghee on the other side. Repeat the same for remaining bread slices. Heat a pan or dosa tawa. Transfer the bread to the pan/tawa carefully. Cook it until brown on one side for 3 to 5 minutes and flip it carefully. Cook for 2 more minutes or until it's cooked completely & remove from tawa once done. Repeat the same process for remaining bread slices. 1. Keep all the ingredients ready. Wash the avocados in running water thoroughly. 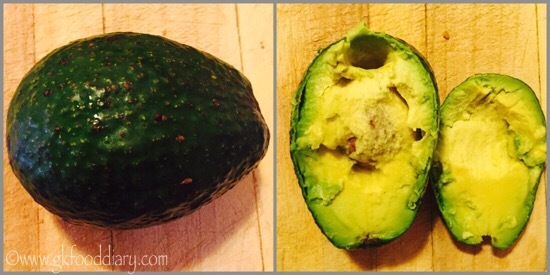 Cut the avocado vertically into two pieces. 2. Remove the big seed in the center part and just scoop out the inner part using a spoon. Collect them in a bowl. Discard the outer layers and seed. Mash the avocados well. 3. Mix all the ingredients in a vessel except bread slices and ghee/butter. Mix well without any lumps. 4. 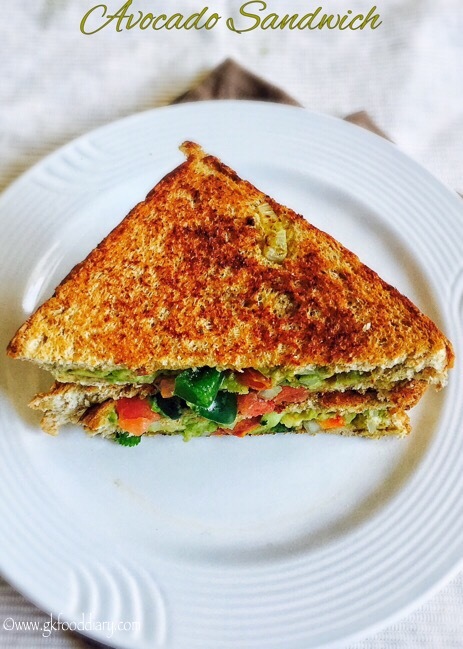 Take a bread slice and spread avocado mix on one side. Close seal it with another side. Apply butter or ghee on the other side. Repeat the same for remaining bread slices. Heat a pan or dosa tawa. Transfer the bread to the pan/tawa carefully. Cook it until brown on one side for 3 to 5 minutes and flip it carefully. Cook for 2 more minutes or until it’s cooked completely & remove from tawa once done. 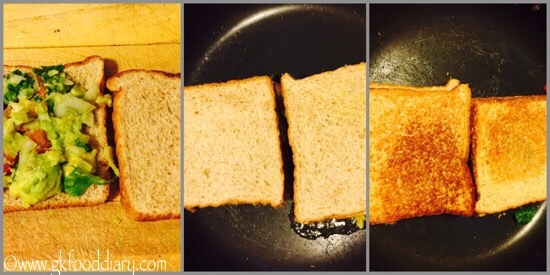 Repeat the same process for remaining bread slices. 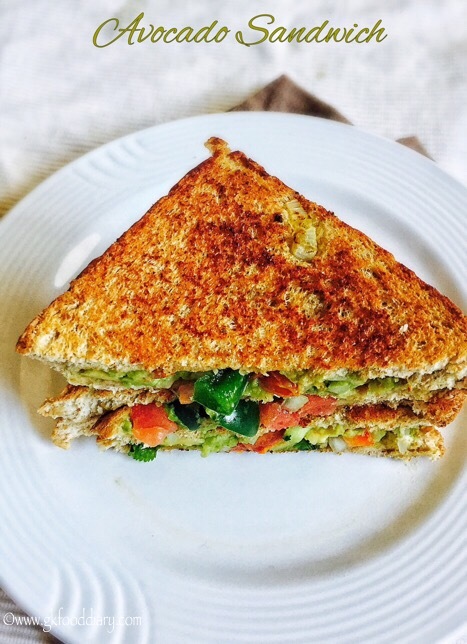 The healthy avocado sandwich is ready ! This avocado sandwich is already creamy and hence no need to use cheese. If you want it more creamier, add grated cheese. Don’t stuff the avocado spread too much on the bread slice otherwise it will come out while toasting. 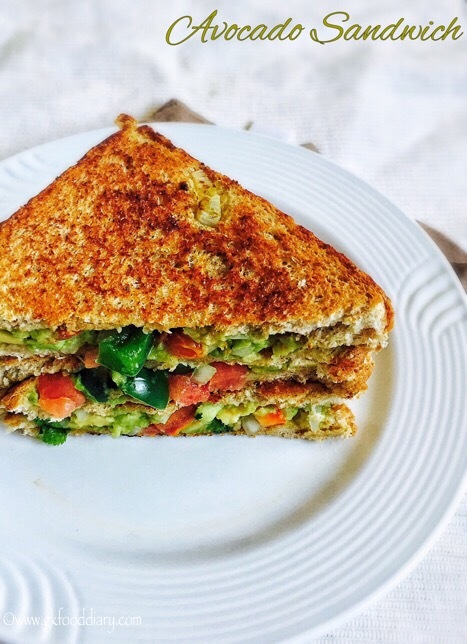 You can add any grated vegetables of your choice to make this avocado sandwich. Always Choose whole wheat bread or multi grain bread for a healthy version.